Former Senator Selina Meyer was a charismatic leader and rising star in her party with her eye on the White House - then she became Vice President. Emmy Award winner Julia Louis-Dreyfus (Seinfeld) stars in Veep, the new HBO comedy series created by Oscar nominee Armando Iannucci (In the Loop). Veep follows the whirlwind day-to-day existence of Vice President Meyer as she puts out political fires, juggles a busy public schedule and deman..
As midterm elections loom, Vice President Selina Meyer (Julia Louis-Drefus) is scoring higher ratings in popularity polls.But even her best intentions can trigger disatrous results. Her staff - Tony Hale, Anna Chlumsky, Matt Walsh, Reid Scott, Timothy Simons and Sufe Bradshaw - are close by with hilarious personal issues and government-insider antics.Special Features Special Features May Not Be In High Definition. Audio & Subtitles Ma..
Julia Louis-Dreyfus returns for a second season in her Emmy-winning role as Vice President Selina Meyer in Veep, the hilarious political comedy created by Oscar nominee Armando Iannucci. As midterm elections loom, Vice President Meyer is scoring higher ratings than the president in several popularity polls, which she hopes will boost her influence and help her curry favor with the chief executive. But despite her best intentions, even t..
HBO delivers a new season of the Emmy®-winning comedy series created by Armando Iannucci (Oscar® nominee for co-writing In the Loop) that takes a sharp, satirical look at the insular world of Washington politics. Veep follows the whirlwind day-to-day existence of Vice President Selina Meyer (Julia Louis-Dreyfus in her Emmy®-winning role) as she juggles her busy public schedule, puts out political fires, and defends the president’s inter.. Starring Julia Louis-Dreyfus in her three time Emmy-winning role, the Emmy-nominated comedy series VEEP, created by Oscar nominee Armando Iannucci, follows the whirlwind day-to-day existence of Vice President Selina Meyer. Following the revelation that the president will not seek re-election, the Veep begins eying a promotion. With all of America now watching her and her team, Selina and her staff head off to Detroit and Silicon Valley,..
All ten episodes from the fourth season of the US political comedy spin-off of British show 'The Thick of It', created by Armando Iannucci and starring Julia Louis-Dreyfus. 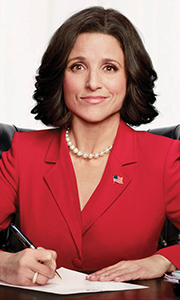 The series follows former Vice President and now President Selina Meyer (Louis-Dreyfus), assisted by her personnel, which include Chief of Staff Amy Brookheimer (Anna Chlumsky) and personal assistant Gary Walsh (Tony Hale), as she goes about her daily business in Off..
All ten episodes from the fourth season of the US political comedy spin-off of British show 'The Thick of It', created by Armando Iannucci and starring Julia Louis-Dreyfus. The series follows former Vice President and now President Selina Meyer (Louis-Dreyfus), assisted by her personnel, which include Chief of Staff Amy Brookheimer (Anna Chlumsky) and personal assistant Gary Walsh (Tony Hale), as she goes about her daily business in Of.. The outstanding comedy series Emmy Award winner created by Armando Iannucci and starring Julia Louis-Dreyfuss (in her 5-time Emmy-winning role), continues its sharp, satirical look at the insular world of Washington politics with new showrunner and executive producer David Mandel in Season 5. Onetime VP and now-President Selina Meyer finds herself in the midst of a tie in the Electoral College. With her presidency on the line, she and h..
Own Veep Season 6 DVD from Deff, DVD, Blu-Ray & 4K Video Specialists - Free UK Delivery.. Starring Julia-Louis-Dreyfus in her three time Emmy-winning role, the Emmy-nominated comedy series Veep, created by Oscar nominee Armando lannucci, follows the whirlwind day-to-day existence of Vice President Selina Meyer. Veep takes a sharp satirical look at the insular world of Washington politics. While Selina has now ascended to the highest office in the land, she must still run for election. Selina and her staff grapple with how to..